The Virtual Health Library comprises a large collection of health information sources and services, such as the LILACS and MEDLINE databases and the My VHL service. The VHL is coordinated by BIREME with the collaboration of a Network of Libraries mostly from Latin America and the Caribbean (VHL Network). In addition to the Regional instance, which comprises most of the products, services and information sources, the VHL is replicated in over 100 national, thematic and institutional instances. 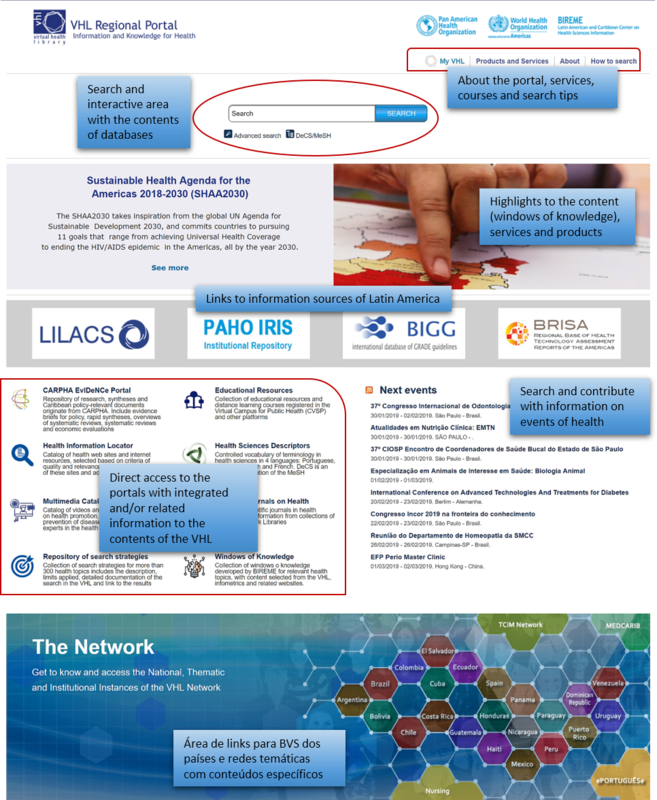 Through the Regional Portal of the VHL, any user can search in over 35 bibliographic bases that, together, sum up to 28 million scientific and technical documents in the field of health, of which over 11 million have access to the full text. In 2018, over 5,5 million users from all regions of the world accessed the VHL Regional Portal, (over 9 million access sessions) and visualized over 42 million pages in the Portal. The changes in the VHL Regional Portal do not stop at the opening page. BIREME has started to modernize the search interface of the VHL (known as the IAHx interface) based on feedback from VHL users and the identification of the main needs, problems and desires of users for a friendlier, more reliable and more efficient interface. According to Verônica Abdala, Manager of Services and Information Sources of BIREME, “listening to and understanding the behavior of VHL users in the process of searching for information is essential for perfecting the services and facilities offered in the VHL Portal. This is a constant commitment for BIREME and contributes to its mission of democratizing access and use of health information for all”. We invite everyone to access the new VHL Regional Portal!